In order for Indeni to run its full set of intelligent knowledge checks, you need to Create a User in the management system for the device you want to add, then add that user to a Credential Set. We recommend creating a unique Indeni user for auditing and security purposes. The privilege level required varies depending on the device type. When possible, we avoid the need to use an administrative account for accessing the device, but in some cases, it cannot be avoided due to limitations to the network device. 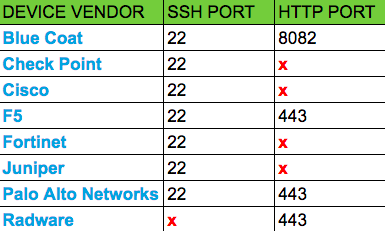 SSH (TCP 22) – Used for collecting information from the analyzed devices. Ping (ICMP Echo) – Devices are pinged regularly by Indeni to ensure they are responding.